Choosing the right light switches & receptacles is an important decision of home and business owners in Central Virginia. Shogun Services has over 40 years of experience installing light fixtures, new switches & receptacles, and any other relevant electrical work and gets the job done quickly and efficiently. While we all like to be our own handyman, working with electricity is a dangerous and hazardous task. One wrong decision can lead to an electrical fire which could do lots of structural damage. Shogun Services is available 24/7 to help you with any electrical service you may need. With hundreds of light switches and receptacles to choose from, the task of making the best selection can your home or business can be an overwhelming one – that’s where Shogun Services comes in! Our valuable experience working in lots of different homes and business gives us keen insight into what designs will look and function the best for your situation. 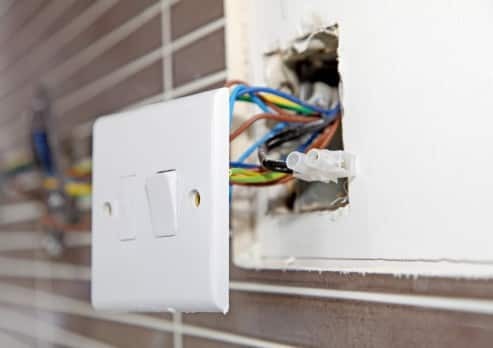 We’ll make sure everything is set up properly, whether it’s a simple light switch or a smart device connected to your phone, we can handle the job. There are lots of reasons to get in touch with the expert electricians at Shogun Services, especially if you think you’re experiencing some electrical problems. If you notice any popping, clicking, or a buzzing sound from your switches, or if you see sparks, give us a call immediately. We’ll make sure to get the problem fixed before any major problem like a fire arises. If your switches feel warm or hot to your touch, or they make your lights or appliances flicker or cycle power, don’t try to fix it yourself, just give us a call and we’ll get the job done.